The last three days I have gone down to my tracking spot under the bridge and found fresh rat tracks. I've seen rat tracks there previously, but never this frequently and never as many as this. The first two days were actually pretty similar to the rat trails I've seen before except there were fresh trails on consecutive days. Today there were a lot more trails so I wonder if a rat decided it was a nice hangout lately and brought his friends back. I didn't see anything that convinced me that it was multiple rats interacting, but it seems reasonably likely to me that it was more than one rat. I wonder why the sudden increase in rat activity there. The river had been relatively high within the last couple of days and has since been receding, but much of the rat activity occurred above where the water reached, so I don't know that it was due to the change in water levels. I didn't notice them to be focused on any particular thing (like the stinky salmon corpse rotting nearby). Nor did I notice them feeding on anything, though it's possible I just missed them picking up insects or whatever. I'm not sure whether it was a black rat (Rattus rattus) or a norway rat (Rattus norvegicus). Elbroch has norway rat tracks in his book, but not black rat and I didn't find any useful information about black rat tracks on a cursory inspection of the Internet. It is my understanding that both species live in this area. I guess I could try and get a glimpse of the rat as it is making the tracks, or live trap one, but I'm not sure I'm quite motivated enough to do that at this point. However, if anybody has information on differentiating between the species, please let me know. 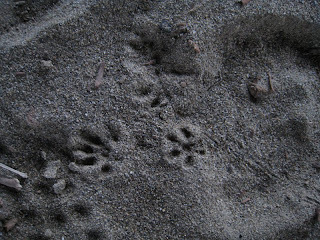 It's interesting to me how different these tracks look despite being from the same animal. I would guess the difference is due to substrate. Last weekend the tracking intensive (a class through Wilderness Awareness School) went over to the Olympic Peninsula. It turns out to have been a fortuitous plan - last year we went to the east side of the cascades for our snow tracking weekend, but the pass was closed this weekend. The weather in the Olympics was beautiful. 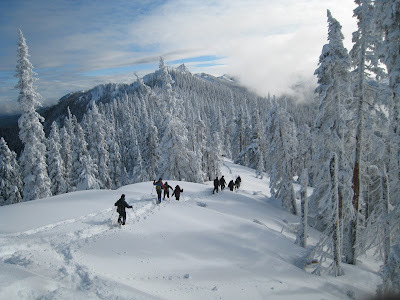 The fog was burning off as we approached Hurricane Ridge and the sun was shining as we began snow shoeing. Along the way we saw numerous snow shoe hare (Lepus americanus) tracks (some folks in the other group actually saw a hare), douglas squirrel (Tamiasciurus douglasii) and long-tailed weasel (Mustela frenata) tracks. 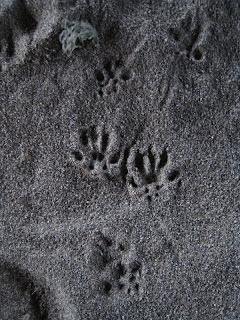 There was some question as to whether some tracks we saw were long-tailed weasel or pine marten (Martes americana). In one set of tracks you could see where a squirrel had plopped several inches into the snow after jumping out of a tree. It then tunnelled back up to the surface and hopped away. In trailing it backwards I saw where it had done the same thing from several different trees. I wonder how it learned to do that - did it happen by accident once and it discovered what fun it was to jump out of trees? How does it know when there is enough snow that it is safe? We spent much of our time trailing a weasel - unfortunately none of my pictures of it's tracks turned out particularly well. It was fun to get a chance to follow its path moving tree well to tree well along its way. At one point we lost its tracks as it went into the snow under a downed tree. Eventually we found its trail again 50 feet away coming out of another gap in the snow by another log. Just a few feet later it disappeared again down a tree well and we stopped searching at that point. It's interesting to think about there being a whole subway system beneath the snow that small animals have access to. The next day was mostly overcast, but was a good day of tracking. We stayed at low elevation and looked in areas where some fishers (Martes pennanti) were recently released as the first in a reintroduction program. We didn't find any fisher tracks, but we did find numerous bird, shrew (Sorex sps), deer (Odocoileus hemionus), bobcat (Lynx rufus), and spotted skunk (Spilogale gracilis) tracks. As we drove through the park towards our destination we saw several trails in the snow along the road. We resisted for a while, but eventually the draw became too strong and we stopped and got out (it was the spotted skunk tracks that put us firmly over the edge). 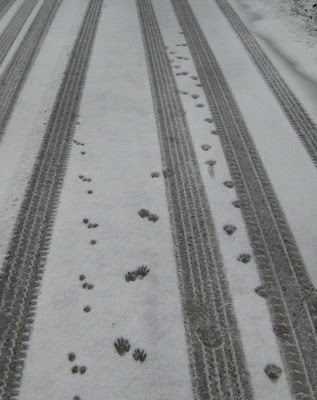 We had the beautiful trails of three different species criss crossing right in the middle of the road. At first I believe most of us thought the skunk was actually a weasel. After some time looking at the tracks, Dave (our instructor) challenged us to look closely at the tracks (the ones I thought were weasel) and decide what we thought they were and why. Not long into the exercise Dave exclaimed that he had changed his mind about what we thought it was. That gave me pause as I had not had any strong question about what it might be. The feet looked a bit strange for weasel, but the gait was completely wrong for squirrel and there is nothing else in that size range that might be in the area, right? (This is the same sort of thinking I had when I ran into a spotted skunk hole earlier in the year.) Dave then suggested we sketch the tracks. I'm generally pretty averse to sketching tracks (not sure why), but everyone else was doing it and I was otherwise mostly standing around waiting, so I got my sketch pad out and sketched. It wasn't until we were gathered sharing our sketches and the difference in claw size on the front and hind tracks was mentioned that I realized they were probably skunk tracks (skunks are generally diggers so have bigger front claws). 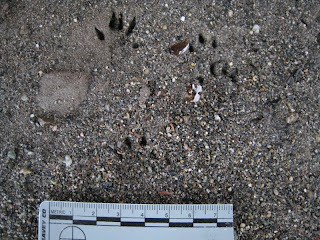 Dave confirmed, pointing out a few more characteristics that differentiate them from weasel tracks - one such being that the middle toes are partially fused and so there is much less splay in the tracks. I definitely need to start including skunks into my mental list of possibilities for western Washington.